On Thursday, June 16, 2016, MH convened representatives from the 28 organizations that received Heritage Grants this year. Our visitors traveled from Detroit, Ypsilanti, Ann Arbor, Flint, Alpena, Muskegon, Holland, and more…We even had three yoopers who came all the way down from Hancock, Baraga, and Escanaba! Over sandwiches and coffee, grantees got the chance to ask questions about the administration, reporting, and evaluation of their projects. 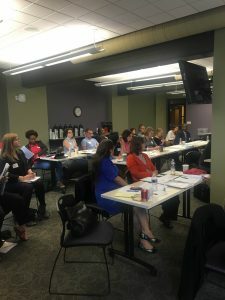 In the process, we all learned a bit about the diverse set of programs represented in the room, as people brought up a variety of questions that highlighted the different challenges they anticipate. After this “housekeeping” was taken care of, we moved on to discussing evaluation. 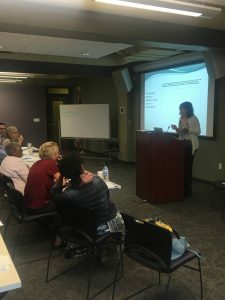 With the help of Nancy Hewat (Synthesis Evaluation and Research) and Lisa Marckini-Polk (Civic Research Services), Heritage grantees learned valuable tools for evaluating the short-term and long-term impacts of their projects. They discussed how the immediate activities and outputs their projects will create might translate into longer-range impacts among the communities and organizations involved. In small groups, grantees talked about how to apply the idea of “most significant change” as a way of evaluating project impacts. The process involves collecting short stories of change from project participants, partners, and audiences and then selecting those which seem most meaningful. To practice this method, people from each project shared insights about the effects they had already seen in the planning stages of their projects, or in the course of previous activities that overlapped with those planned for their Heritage projects.